The Federal Energy Regulatory Commission (FERC) held a technical conference on June 27-29, 2016 to discuss opportunities for increasing real-time and day-ahead market efficiency through improved software. 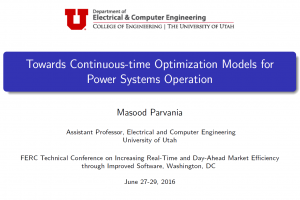 Dr. Parvania presented at the conference on recent developments on novel continuous-time Unit Commitment (UC) model for power systems operation. The new continuous-time UC model schedules for continuous-time power and ramping trajectories of generating units. In addition, the model enables the continuous-time marginal pricing of electricity in power systems. The presentation is available online here.